Horror enthusiasts everywhere are spoiled rotten this year as multiple movies within the paranormal genre have been released or are set to be by the end of the year. One of the movies that is on every spooky fan’s to-watch list is the highly anticipated sequel to the 2013 hit movie, The Conjuring. Directed by Malaysian-born James Wan, The Conjuring 2 sees the return of paranormal investigators and authors, Ed and Lorraine Warren. The couple venture off to the United Kingdom to assist the Hodgson family, who are experiencing poltergeist activity at their Enfield council house in 1977. Once again, the plot is based on a ‘real-life’ story known as the ‘The Enfield Poltergeist’. 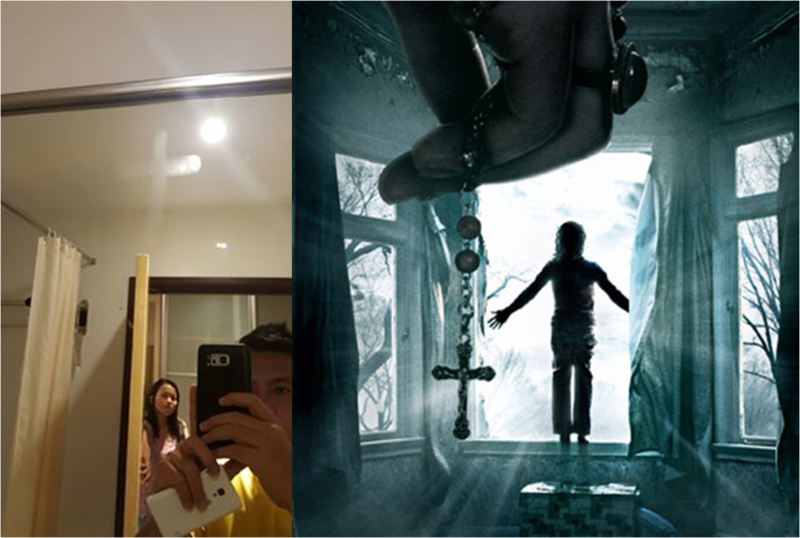 So like most horror movie fans, Singaporean Damian Ng Yih Leong and his girlfriend decided to watch this movie during their recent trip to Miri, Sarawak and they were left with much more than they bargained for. As the couple returned to their room in the Imperial Hotel at about 2.30am, they were too drained to do anything much so they decided to have a quick nap. 15 minutes later, Damian’s girlfriend woke up to brush her teeth before fully falling into a deep sleep. It wasn’t until she came out of the bathroom that the suspense began to build. 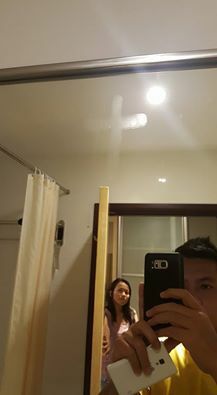 Without thinking much about it at first, she asked Damian why he felt the need to prank her by drawing a cross on the bathroom mirror at this late hour. Puzzled, Damian could only assume she was the one who was pulling his leg as he hadn’t moved an inch from the bed since they had entered the room. When realization hit that no games were being played that moment, they cautiously went to the bathroom to investigate properly and what they saw sent terrified chills down their spine. Clear and still fresh was a cross seen vividly drawn on the mirror with droplets of water still creeping down on one side of the cross as though it was just shaped moments ago. With the stain looking so newly drawn, Damian told his girlfriend that it was near to impossible to say he was the one to draw it when she had been in front of the mirror the whole time and that she would have seen him clearly if he did. Feeling the shivers of paranoia crawl through their skin, they quickly requested from the management to have a change of room and despite the late hour, the staff were kind enough to comply. By 3am, the couple found themselves settled in a different room where they were able to rest with a more comfortable state of mind. The next morning came by and when they went back to their original room, they realized that the cross drawn on the mirror was no longer seen, making the overall scenario far creepier than it already was. Should any brave soul wish to know, the room they were placed in at first is room 6115 in the new wing. Putting the supernatural event aside, Damian goes on to commend the staff at Imperial Hotel for being understanding of their wishes and accommodating to their late-night request. “After our room change, we did not encounter anymore weird incidents. This is my first first hand encounter with paranormal activity and it was certainly hair raising for us,” said Damian in his Facebook post that went viral instantly as others shared their sentiments on the chilling experience. The couple’s experience shows that The Conjuring 2 is not your typical ghost story and is taking the paranormal scene to a new level. In fact, the cast themselves have spoken up about strange incidents occurring whilst filming this movie and director James Wan himself has admitted to some suspicious activity happening behind the scenes. When asked on his thoughts on the supernatural and the existence of the afterlife, he comments on how he keeps an open mind about things he might not be able to see. “Being raised religious means that I take certain things with a touch of faith, in terms of my beliefs. I do believe in stuff like this, that’s why I think I’m somewhat attracted to this world,” said James. Have you watched The Conjuring 2 yet? If you have, did you experience any paranormal activity afterwards? Share them with us in the comments. And you can read the full story of their experience in the Facebook post below.